Product prices and availability are accurate as of 2019-04-24 15:11:06 EDT and are subject to change. Any price and availability information displayed on http://www.amazon.com/ at the time of purchase will apply to the purchase of this product. Alan Mathison Turing. Mathematician, philosopher, codebreaker, a founder of computer science, and the father of Artificial Intelligence, Turing was one of the most original thinkers of the last century - and the man whose work helped create the computer-driven world we now inhabit. But he was also an enigmatic figure, deeply reticent yet also strikingly naïve. Turing’s openness about his homosexuality at a time when it was an imprisonable offense ultimately led to his untimely death at the age of only forty-one. 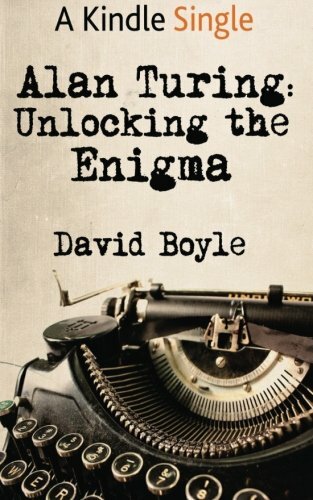 In 'Alan Turing: Unlocking the Enigma', David Boyle reveals the mysteries behind the man and his remarkable career. Aged just 22, Turing was elected a fellow at King's College, Cambridge on the strength of a dissertation in which he proved the central limit theorem. By the age of 33, he had been awarded the OBE by King George VI for his wartime services: Turing was instrumental in cracking the Nazi Enigma machines at the top secret code breaking establishment at Bletchley Park during the Second World War. But his achievements were to be tragically overshadowed by the paranoia of the post-War years. Hounded for his supposedly subversive views and for his sexuality, Turing was prosecuted in 1952, and forced to accept the humiliation of hormone treatment to avoid a prison sentence. Just two years later, at the age of 41 he was dead. The verdict: cyanide poisoning. Was Turing’s death accidental as his mother always claimed? Or did persistent persecution drive him to take him own life? ‘Alan Turing: Unlocking the Enigma’ seeks to find the man behind the science, illuminating the life of a person who is still a shadowy presence behind his brilliant achievements. David Boyle's work has been widely praised. ‘The tone of the book may be gloomy but there is plenty of entertainment value …’ Anne Ashworth, The Times ‘Exhilarating’ Daily Mail ‘He tells these stories, on the whole persuasively and with some startling asides.’ New Statesman ‘A book that is engagingly sensitive to the sentiments of what is sometimes called “middle England”’ Dominic Lawson, Sunday Times David Boyle is a British author and journalist who writes mainly about history and new ideas in economics, money, business and culture. He lives in Crystal Palace, London. His books include ‘Unheard Unseen: Warfare in the Dardanelles’, ‘Towards the Setting Sun: The Race for America’ and ‘The Age to Come’.